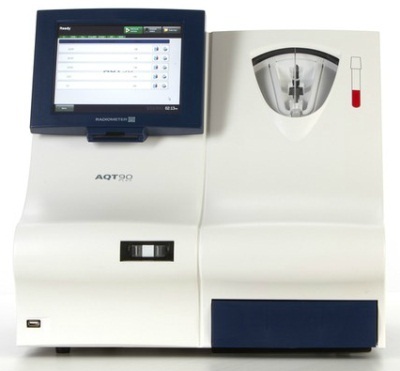 Radiometer’s AQT90 FLEX immunoassay analyzer delivers quantitative results with lab quality in as little as 10-21 minutes, depending on the parameter. The AQT90 FLEX analyzer is ready when you are, with a throughput of up to 30 samples per hour and up to 240 tests on-board when the analyzer is fully loaded. It measures on whole blood and plasma*), eliminating the time-consuming process of sample preparation in the lab. You can get up to 5 tests from a single blood sample. Operator safety is enhanced because there is no contact with biohazards. By minimizing pre-analytical sample handling and utilizing closed tubes, the AQT90 FLEX analyzer helps prevent exposure to waste or blood-borne pathogens. The AQT90 FLEX analyzer has built-in quality checks on testing processes, ensuring accurate and precise analyzer performance.